Myself and a buddy were talking a while back and we noticed that's no real options if you want a reasonably slim, small keyboard to carry around. This was for the longest time due to MX stemmed switches being so tall. Recently, Kailh unveiled some low profile switches that are scarily small, so we decided to take a crack at the design thing. We designed and tested the layout (on paper and by playing with a planck), designed a PCB, and are currently sourcing parts and working through the case design. For clarification, the Fn keys on the keyboard are dummies. They're to be programmed with whatever the user desires. The keycaps for them will be provided in several variants. They can be labelled with the default mapping (shown below), as Fn, or blank. We are currently in the process of securing keycap sources for the switches (as they use a different stem from MX), and have reached out to both GMK and Signature Plastics. The current projected thickness for the full keyboard is ~20mm or about 0.8", but we're shaving off thickness everywhere we can, and can probably shave a few more mm from this, if all goes well. The current prototype uses SMD LEDs under each key, and a USB-C connector. If the KB is connected to a USB-A port, or cannot provide the full USB-C power for whatever reason, the LEDs will operate in "legacy" mode. Legacy mode simply limits the max brightness of the LEDs, and scales down the brightness steps. This should be plenty bright, but if you have proper USB-C, and feel like pushing the brightness to max, each key will produce some 250mcd of light. These switches have a total travel of 3mm, and actuate around 1.4mm. They are tiny tiny little things. What do you think of the design? Would you like to see the case in plastic/acrylic or metal? Would you buy it? We'd love to do a group buy if there's interest. I'm going to say GMK can't help you on the keycaps and I doubt signature plastics would either as neither of them make keycaps to fit kailh low profile switches. That was my initial reaction, but my design partner noted that there's no harm in asking, so we did. Both companies have been extremely helpful and, last we checked, were discussing the feasibility of creating tooling with their engineers. GMK is currently the more prompt of the two, and have said that they can probably do keycaps for us, MOQ and tooling cost TBD. I would be interested but only if it's a split keyboard and has USB-C.
USB-C will be pretty much mandatory due to the current draw of even the smallest RGB LEDs. So yeah, it'll be USB-C.
As for split, I had never thought about that. We'll talk it over and see what we can do. If there's enough support, we can split it. I think this could be a cool idea, but a full grid spacing would be nicer, even if it excluded RGB. By full grid spacing do you mean no 2u keys, just 1u and the 3u spacebar? Wish there was a "silent" low profile switch. I'd probably be all over this if that were the case. Would any of those three be up to scratch for noise? Ah. Gotcha. So something between the preonic and atomic in size. There was a bunch of discussion between the two of us designing this KB whether to go full 1u grid, but we both found 1u shift and enter to be too easy to miss. The split space was my suggestion, as it gave you an extra key if you only hit space with one hand (I do this a lot), without going full 1u, and assigning 4/5 keys to space. Now neither of us are experts with ortho layouts, so full 1u grid may not be as bothersome for most as it is for us. As my stats lecturer once said "MORE DATA IS REQUIRED". I like this idea of a super thin board with low profile switches, but the layout looks a little funky. The numbers are in the wrong columns. Also, why are there so many Fn keys? Didn't you say you wanted to avoid using layers as much as possile? I think making this a split board would make it harder to carry around which is the main idea. Any thoughts on a wireless mode? Splitting the board would indeed make it more of a hassle to carry. Re: the function keys, they're more meant to be "program these to whatever". The ones near the arrow cluster I'd assign to pgup/pgdn, the one near caps would be a leader key. I also didn't want my personal hatred of layers to get in the way of those who like them. I'll probably only have one or two layers on the thing myself, but I'd like the keeb to be highly functional for most if not all users. You do you fam. Re: Numbers. Oh drat. You're absolutely right. I knew something was up but I've spent so long staring at the layout I don't see most of it anymore. I've updated the original post with an alternative that has numbers in line. Re: Wireless - Honestly, we can't. Not with LEDs anyway. The power draw of an RGB LED array destroys the power budget of any battery that we could conceivably fit in the case (Remember the total thickness is less than an inch). We did spend some time considering a wireless version, and mocking up a design, but that's a project for another day. This is one of those "it'll happen in V2" things, but thanks for bringing it up. It's certainly an option if we replace the RGB LEDs with single colour. So does that mean that 'Fn' would be the legends for the keycaps that ship with the board? Maybe you could include caps with legends that match the default mapping in addition to the Fn keys. Good idea! I've updated the top post. Check it out. That's quite a lot of 2u keys, wow. If you can find a manufacturer to produce keys for it, I'm all in. We may end up just having to have two keys and a custom keycap, but I'd rather avoid that scenario. For now, it looks like GMK may be able to manufacture keycaps for us, and we'll play around with stabs or no stabs on the 2u keys. In any case, happy to hear you're on board. Did anything in particular attract you to this KB? What is the \\ key for? It is a leader key. A key that you press and follow with another key (as opposed to press at same time hotkeys). It's a sort of convention with the people I work with that the leader in vim is \\ (double tap backslash). In the default keymap the leader key will be used for bootmagic options, such as switching caps and ctrl and Leader -> <Number-row> will output the F keys. (e.g. \\3 will output F3. Thus Alt+F4 would be \\Alt+F4 (Mods are not affected by leader). By default, the leader will wait 1000msec (1 second) for the next input, and then timeout. When the leader times out, the Leader LED will blink. Since the keyboard will be programmed in QMK, this is all re-programmable. I'm interested if it doesn't cost a fortune. I stopped buying keyboards because I realized how broken the staggered layout is. Let's split is interesting, but is missing the F keys and the keys aren't low profile. IIRC there were a few interested in a let's split with F keys. No need to move the hand for arrows, page up down. If it's fully programmable I can make my own layouts. Interesting idea, I'm curious how the project will progress. Re: "The keys aren't low profile"
This keyboard *is* being designed with Kailh low profile switches. What do you mean precisely? Keycaps? The keyboard will support QMK, so you can create your own layouts. Thanks for the thoughts in any case. I'll keep it in mind. It does seem like people like their split layouts. When you say low profile, do you mean that the overall board is quite thin, or that the case won't cover the bottom of the keys? If it's the former, what sort of thinness do you think is achievable? I mean the former. We're using Kailh Low-Profile switches. Our current CAD drawings say 0.8 inches from bottom of case to top of keycap, and we think we can still shave another 1/10" from that. I prefer low profile switches (like scissors switches) found in old IBM laptops or ultranav keyboards. I don't like the classical mechanical switches or Topre, they are too tall for my taste. Maybe you should place a link to them in the first post. Great idea. I should've done that initially. 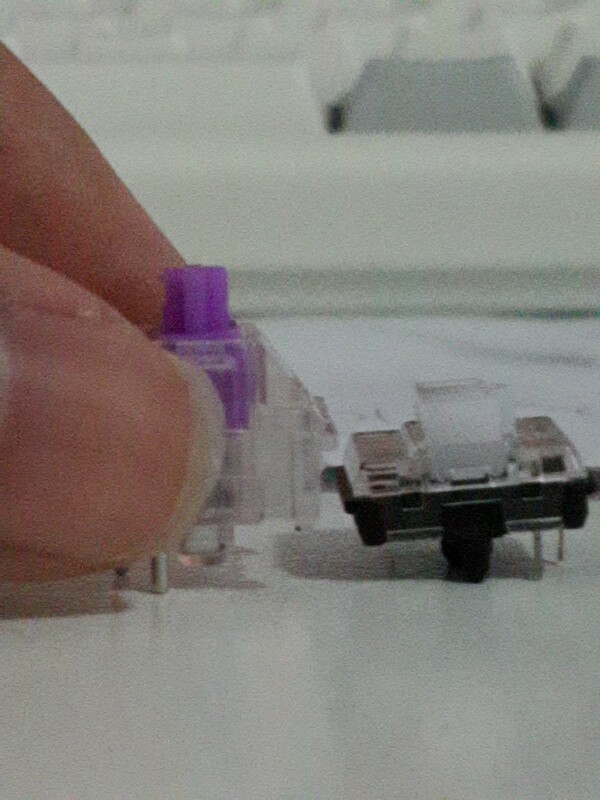 I've linked a general review as well as a picture next to an Outemu Purple (normal MX switch). The switches are tiny. Page created in 0.087 seconds with 47 queries.